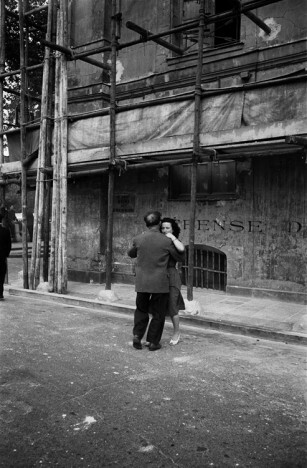 One of best known photos by Johan van der Keuken (1938-2001) is a dance scene on the Ile Saint-Louis in Paris, taken during the ‘Quatorze Juillet’ [Bastille Day] celebration in 1958. This photo was first published in the book Paris Mortel (1964). Another 32 negatives were found in Van der Keuken’s archives, taken on the same day and the same spot. These never-before-published photos form the basis of the exhibition Johan van der Keuken – Pictorial Narratives which is currently held at Foam Fotografiemuseum Amsterdam. The series shows the history of how the well-known photo came to be created and elucidates Van der Keuken’s perception and way of working. The compilers of the exhibition (Noshka van der Lely and Willem van Zoetendaal) have also selected a number of Van der Keuken’s other series, some of which have never previously been exhibited.